Australian Minister for International Development and the Pacific, Senator Concetta Fierravanti-Wells is back in Samoa to host a roundtable discussion on disability inclusive development. The discussion is a lead up event to next year’s Convention on the Rights of People with Disabilities. Samoa recently ratified the CRPD giving more support, and putting the spotlight on the support and inclusion of persons with disabilities in Samoa. Nuanua O le Alofa’s Office Manager, Mataafa Faatino Masana Utumapu says the ratification is only the beginning. “Our efforts should not stop at just the ratification of CRPD by our government. That’s where the real works begin to reach every person with disabilities all over Samoa to make sure they are included and are being offered a chance to be a part of society,” she said. 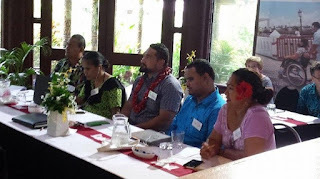 Senator Fierravanti-Wells says the discussions held in Samoa would shape the movement by each service provider and non-government organization in the country to better recognize the abilities of these people instead of their disabilities. “Through this we wish to show our commitment to people with disabilities and to enable them to use their abilities to make a good contribution to their families, their communities and really with the incentive of leaving no one behind,” she said. “The push with good programs, we can see some fantastic results and we can see them as people with abilities and focus on their abilities to encourage them to make a difference in their economy,” she added. For Samoa, the efforts continue to rise along with the awareness of the inclusion of people with disabilities. The Chief Executive Officer of the Ministry of Women, Community and Social Development says challenges also continue to rise. “We face different challenges every time, sometimes because we need to provide a platform for education, for people with disabilities, funding, and so much more. So we’re thankful for Minister Fierravanti-Wells for visiting and hosting this discussion, because its reassurance that the Pacific shares these issues with big name countries like Australia,” she added.